Mission : To serve the people of Princess Anne, Maryland and all nearby communities within its fire district, to the best of our ability, by responding to all alarms of fire, rescue, and medical emergency, protecting life and preserving property, and educating the public with the modern methods of fire prevention. Have you ever thought about serving your community ? 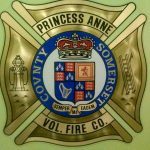 Why not join the Princess Anne Volunteer Fire Company as a Firefighter or EMS Provider. Free training provided through MFRI. Call us at 410-651-2144 or email infor@pavfc.org for more information.